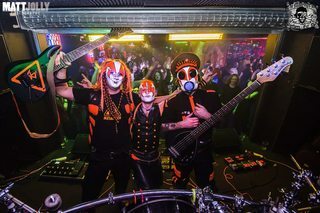 Lead guitarist and petrolhead with Scottish Industrial rock trio Metaltech (and our alter-ego folk band Acoustech) - EPs and album available on Spotify, iTunes, Amazon etc. Been gigging for 25 years, taught guitar on and off. Played a lot of the Scottish music festivals (Rock Ness, Wickerman, Belladrum etc), supported bands like Monster Magnet, Alec Empire, KMFDM, Angelspit, Psydoll. Headlined all over Scotland. On stage usually use Ibanez (7 string RG7321 and Joe Satriani signature models), or a 1989 Charvel Predator with a Dimebucker pickup through a Kemper Profiler and a DigiTech Whammy, sometimes with a CryBaby. For the songs requiring fire I use a 7-string BC Rich Warlock with pyro attachments! Generally DI'ed straight into the venue PA or through Laney 4x10s - the Kemper is happy either way! Sonar and Cubase are my preferred audio platforms. Moderator of the Security, Music, AVP, Outdoors, Sound Design, and Parenting Stack Exchange sites. 4 No tag for "Adobe Audition"
4 What should our chat room be named?